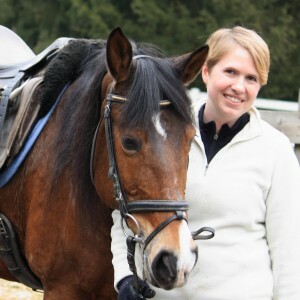 Mara Dabrishus is an award-winning author of young adult equestrian fiction. Mara grew up in the Arkansas Ozarks, and is currently a librarian at a small private college in Northeast Ohio. When she’s not writing, she’s researching horse racing, out running, or riding a dressage horse in a series of circles. Stay the Distance is her first novel. I like to write about horses, specifically horse racing, so I draw inspiration out of the racetrack and the beautiful animals that inhabit it. I’m inspired by the spark I find in my characters, and by imaging how they’ll react to each other and the situations I put them in. You can find a bit of inspiration in just about everything! I am a meticulous outliner, with character profiles and timelines and even Excel spreadsheets. Sometimes this becomes a jumbled mess, which is why I invested in Scrivener. It allows me to connect scenes to an outline, separating the story out so I can see where it’s going. Then I like to go low-tech. For my most recent novel, I did a W-Storyboard of Post-it notes directly on my wall. My novel’s plot, right there in the living room! It helped me see the story arcs, potential holes, and made me stay on track. Sometimes even the ubiquitous Post-it note saves the day! My characters live very full lives in my head, but they don’t talk to me. I’m pretty happy about that, because can you imagine how hard that would be? I have a lot of characters running around, so I’d never get anything done! My characters talk to each other, and I mold their words and actions. Sometimes this happens when I’m not even writing, and I have to dash for a piece of paper or grab my laptop so I can write down that perfect interaction or line of dialogue. Some of my best writing will float along when I least expect it! Writing is a journey. The biggest step you make for yourself as a new writer is simply starting, because without that first step you’ll never grow and improve. It takes a lot of dedication to write a novel, and it takes even more to honestly edit it, and then even more to publish it! But you’ll never get to that point if you don’t start. My first novel, Stay the Distance, is self-published. I decided to go this route after researching the market, where I found a thriving indie horse book community. Traditionally, horse books are a hard sell for publishers, but horse lovers are a dedicated bunch, and they deserve books just for them. I consider myself lucky that there’s such a prolific niche of horse book authors online, bravely doing their own thing, calling all their own shots, and making all their own creative decisions. It’s hard work, but they’re trailblazers, and I’m proud to be among them. Book publishing is making big strides toward print on demand and subscription services like Kindle Unlimited. Book borrowing might become the next big thing!